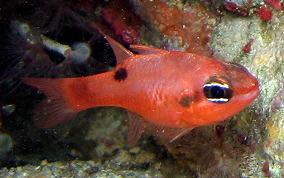 Named, I'm sure, for their brilliant orange color, this member of the Cardinalfish family, will be found hiding in reef recesses close to the sea floor. Occasionally you will see them peek out. For beginner snorkelers, these are easy to see because they are commonly in very shallow water. Just look under low overhangs and holes between rocks. They average about 3 inches in length. They will normally have a black spot behind the eye and on the gill cover and one below their rear pectoral fin. (Two Spots) and a dusky area at their tail base. I don't quite understand it but the Two Spot Cardinalfish (Apogon pseudomaculatus)will have an additional spot on their tail just before the fins. (So actually it should be called the 3 Spot Cardinal fish. 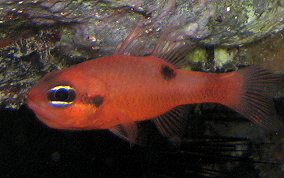 These two Cardinal fishes also have two white horizontal lines across the eye, one on top and one on the bottom.